Monster Research Blog: Mermaids-start of a paper! The stories of the mermaid have been passed down through numerous generations in nearly every continent. Writers and artists alike have been memorized with the image of the mermaid and the symbolism she brings of beauty and mystery to the sea. The lure of forbidden love between species or even possible death peaks the interest of almost every human that falls upon her story. Mankind have been fascinated with the tale of this magical and mythical creature back to ancient times. Pliny the Elder, a Roman naturalist wrote, “ And as for Meremaids called Nereids, it is no fabulous tale that goeth of them: for looke how painters draw them, so they are indeed. Author Thomas Kneightly writes in his book The World Guide to Gnomes, Fairies, Elves, and other little people, that the mermaid in Sweden otherwise known as “Havfrue” truly is beautiful in her appearance. The fishermen either see her in the summer’s sun combing her blonde hair on the rocks. 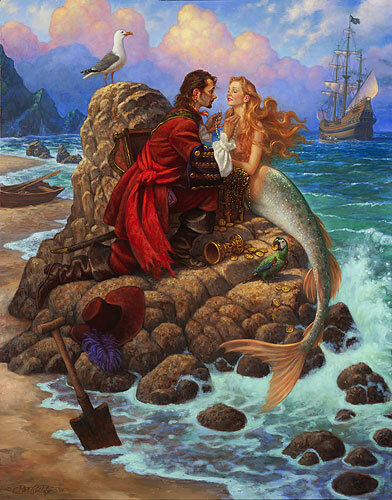 The mermaid is compared to Elve-women who approach on shore the fishermen at their fires to their love. A supposed talent of these mystical women is their abilities at fortunetelling. In fact, it was a mermaid that is said to have prophesied the birth of Denmark’s monarch Christian IV. One prophesy says, “A mermaid from the water rose, and spaed Sir Sinclar ill.” Though it would seem that the men would welcome this presence they see her appearance as a storm that produces no success in their fishing.